It is a Electronic Clock/Thermometer, Working Voltage: USB 5V, Function: Time display, Alarm Clock S.. It is a Green Lcd Display Car Tester Charger, Input Voltage: 12 ~ 24V, Output Voltage: 5V, ±5%, Outp.. It is a Green LED Car USB Charger Voltmeter,Input voltage: 12V and 24V Universal,Function:Car batter.. It's a Large-screen LCD display Thermometer, while measurements show two temperatures, extended prob.. 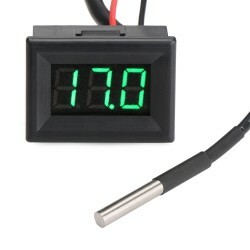 It is a 0.56 "Digital Thermometer,Power Supply DC5-28V,Measuring Range 0-167°F (Fahrenheit),It has .. It is a DHT-11 Digital Temperature and Humidity Sensor, Relative humidity and temperature measuremen.. It is waterproof DC18B20 sensor digital thermometer, measure temperature accuracy heigh, can measure.. It is a DC 12V 24V Temperature Meter/Digital Thermometer, Power Supply voltage: DC7~30V ( with anti-.. The logger is mainly used for recording food, pharmaceuticals, chemicals and other temperature-sensi.. It is a Red/Blue/Yellow/Green/White Digital Voltmeter,Digital Clock ,Digital Thermometer 3in1 Multif.. It is a multi-usage Digital Thermometer,Measuring temperature Range -50 °c ~ +300 °c (-58 °F ~ +572 .. It is a 6in1 USB Digital Meter Portable Multifunction USB Doctor USB 3.0 Tester Meter/Monitor, Appli..